Added on October 14, 2015 by Jessica Yurasek. Sightseeing certainly has its limits. But when you're in the middle of India and you don't know if you'll ever return, no matter how hungry or tired, you see the sights that are there to be seen. Today on the blog, I'm picking back up in India—where I last left off in the story of our extended vagabond journey around the world. It is at this point in time during our great world adventure that I am becoming increasingly exhausted from continual travel and lack of stability. But I'll save my commentary on the challenges of longterm travel for another post. 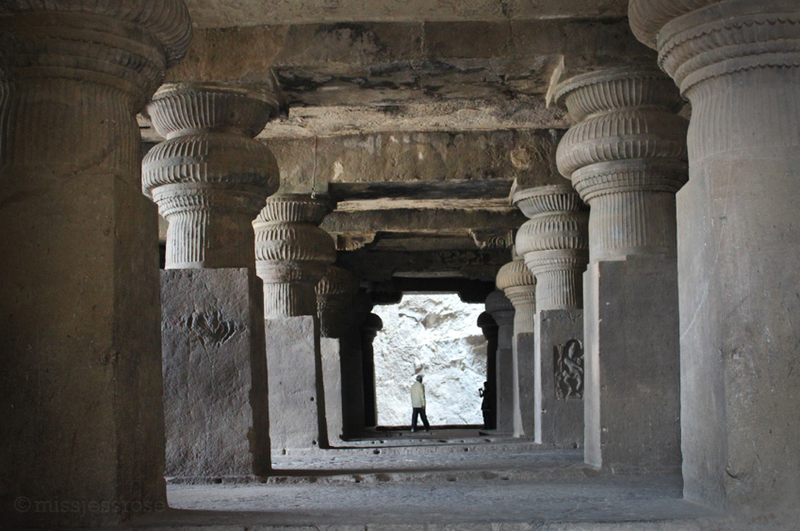 If you recall, when last I wrote of India, we had just toured the ancient Buddhist caves of Ajanta. 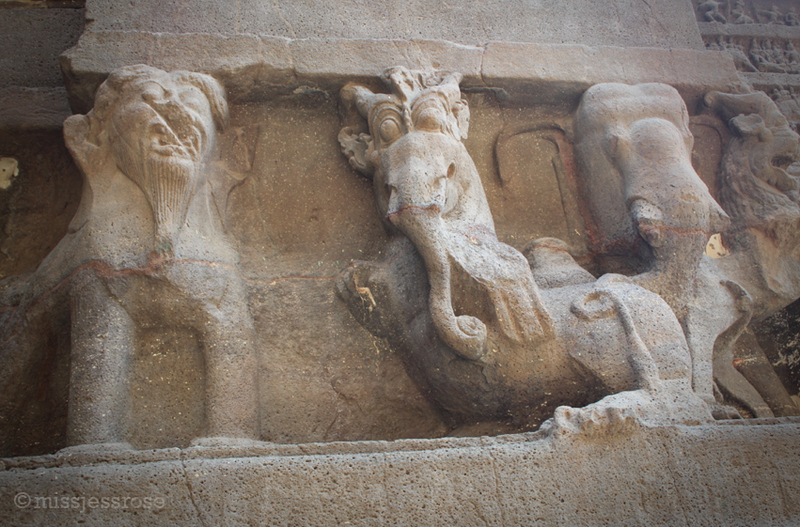 The next day is spent exploring the equally stunning, but more recent, Ellora caves. I say recent, but 800 AD is not exactly modern times. Stepping inside these ancient works of art, I think about how baffling it is that human hands so long ago made these very beautiful, old things. I try to imagine what it must have been like to live a few thousand years ago, to create a massive project like this without modern tools and technology. 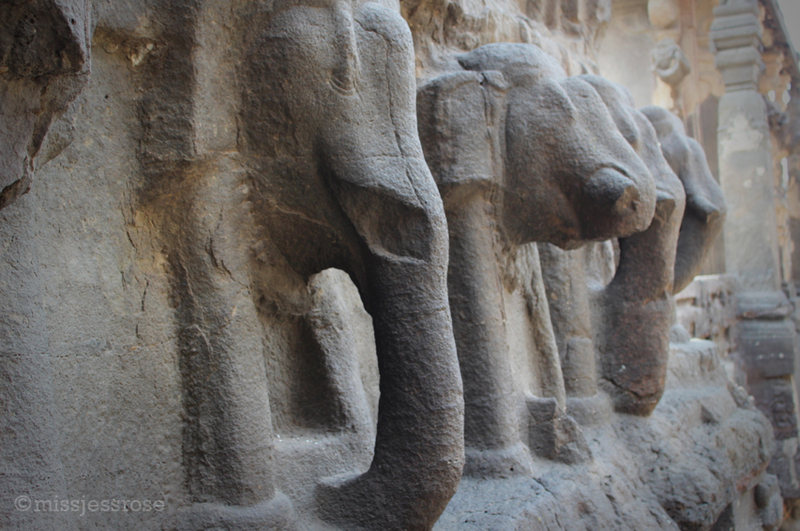 The 34 temple caves, recognized as a UNESCO World Heritage site, were excavated from a rocky cliffside with stone figures and designs carved directly into the basalt rock walls. They are stunning. My mind, impossibly, goes through a reenactment where I time-travel centuries backwards to meet the creators of these artworks. In this scenario, of course I look absurd to them. I'm dressed in modernity, snapping photos with an iPhone, walking around in ugly tennis shoes and a floppy sun hat—this in contrast to the refined figures and beautiful Indian saris surrounding me. 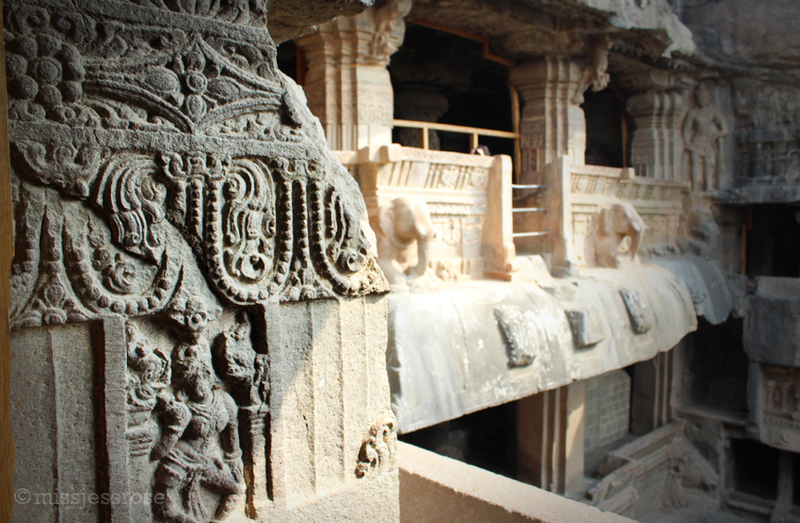 How are the Ellora caves different than Ajanta? 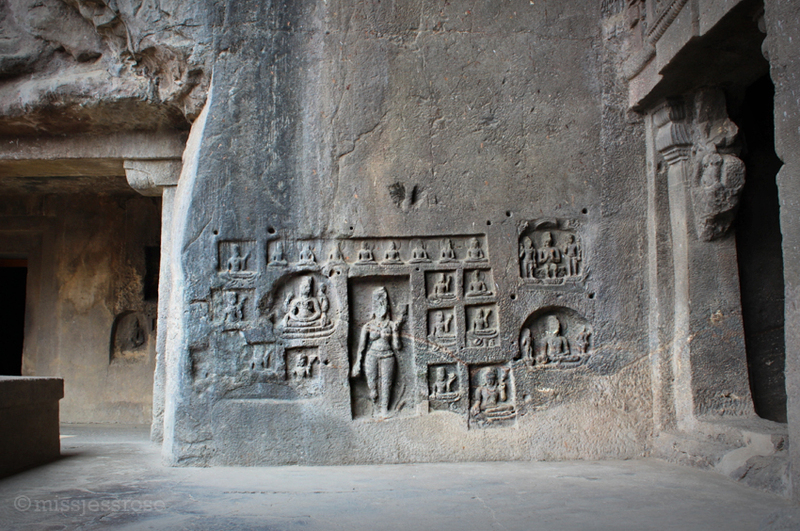 For starters, the first segment of cave carvings were done by people of the Jain faith, as opposed to Buddhist or Hindu. Thus, the style is noticeably different. 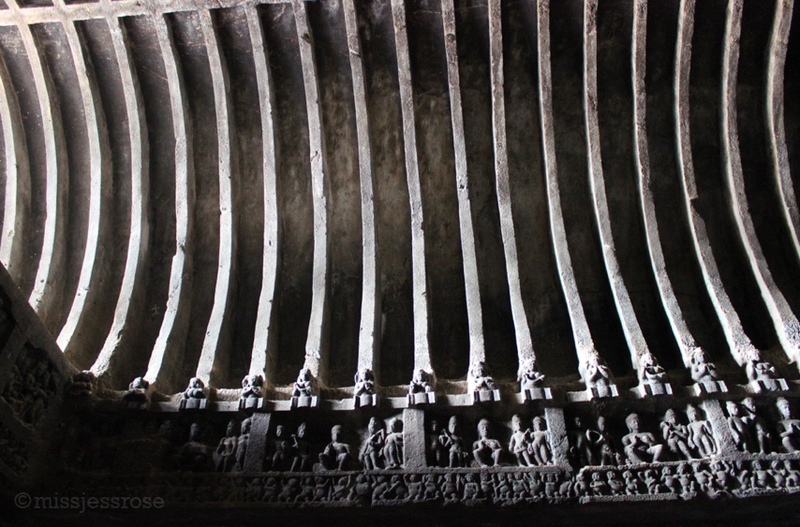 The carvings here are better preserved, probably because they are younger than the Ajanta carvings. 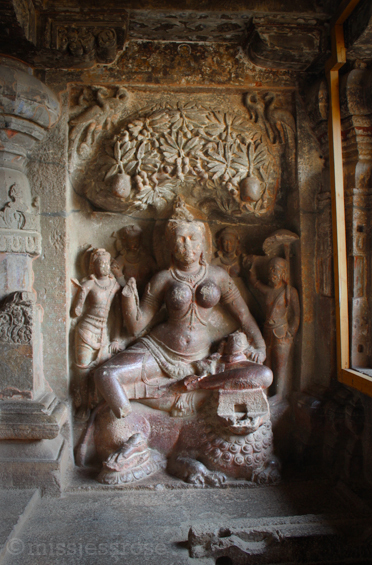 Jain figures and designs vary. 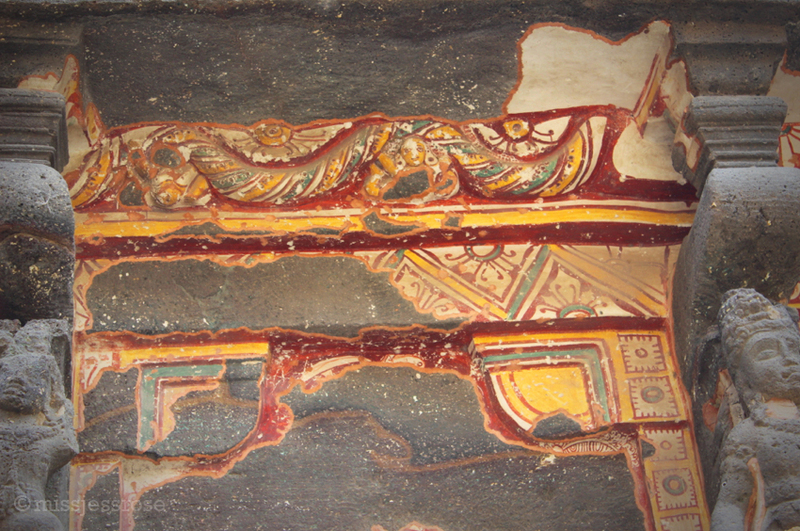 The characters have flat limbs with elegant, long arms and legs, and are adorned in carved detail including jewels and distinguishable hairstyles. We weave through narrow, winding passageways from one room to the next. The darkness in each chamber feels a bit like walking through a scene from Indiana Jones. Bats squeak and flutter, annoyed by our presence. I come upon a large, dark meditation chamber. 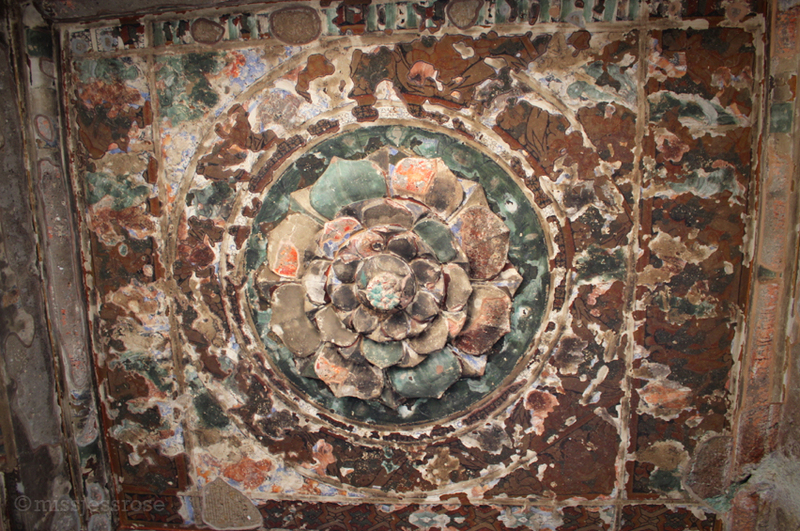 Someone calls out a deep om, holding the tone which is amplified by the stone walls. I pause to listen and feel the echoing vibration. Again I imagine monks here, centuries ago, and the power they would have generated chanting om together in this shadowed space inside the earth. It must have been otherworldly. 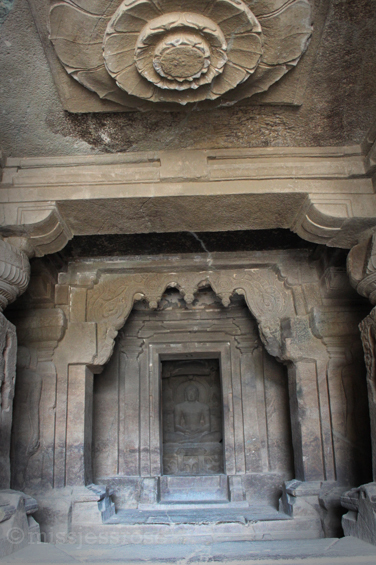 The exterior of Ellora caves, which are carved into a basalt rock cliffside. Moving along from one monastery cave to the next, the chambers become progressively older. 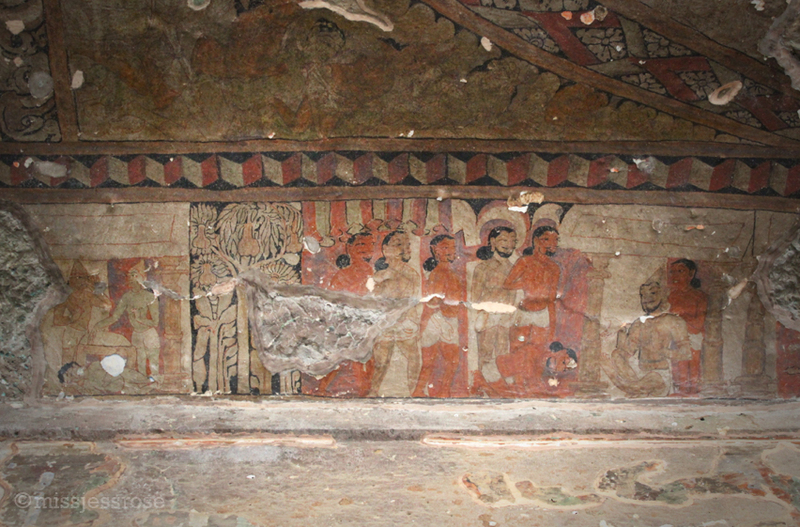 Some earlier caves are Buddhist in style, but we start to recognize a cultural blending as figures that were once solely Buddhist eventually turn into obviously Hindu designs. 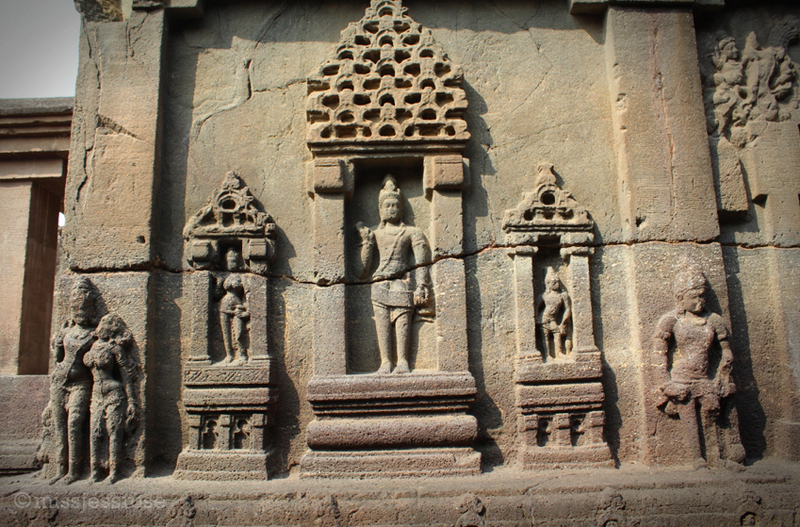 Now, silent strong Buddhas sit next to representations of Vishnu, Shiva, Lakshmi, and Krishna. The Jain characters are behind us. 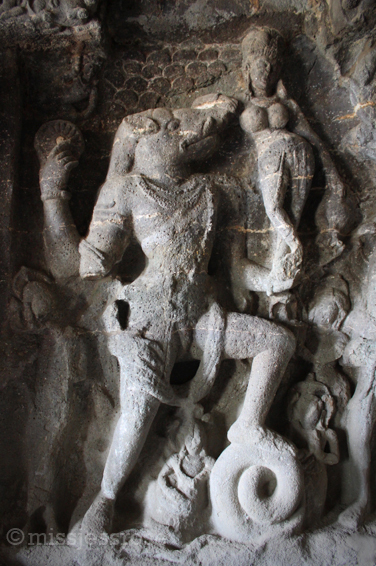 The most stunning cave is number 16, a large megalith known as the Kailasa temple. 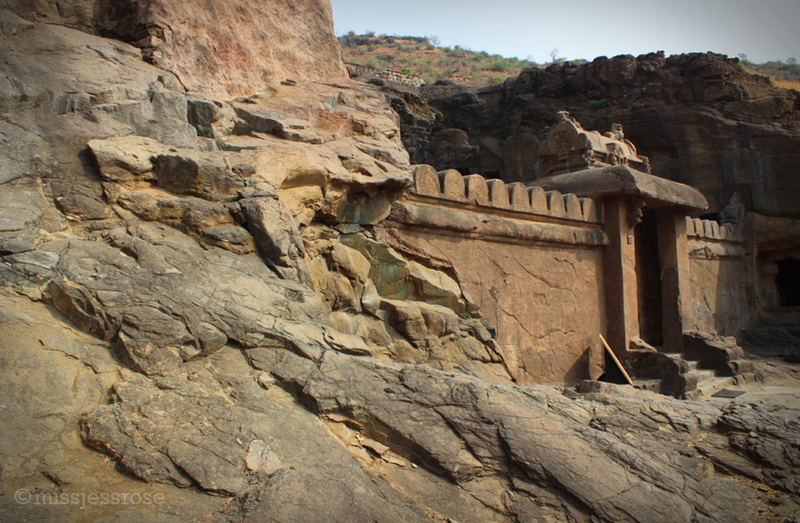 Instead of excavating horizontally as with other caves, this structure was excavated from the top of the rocky cliff downwards. This feat of labor took generations of workers 200 years to complete. No wonder it's the shining gem of Ellora. 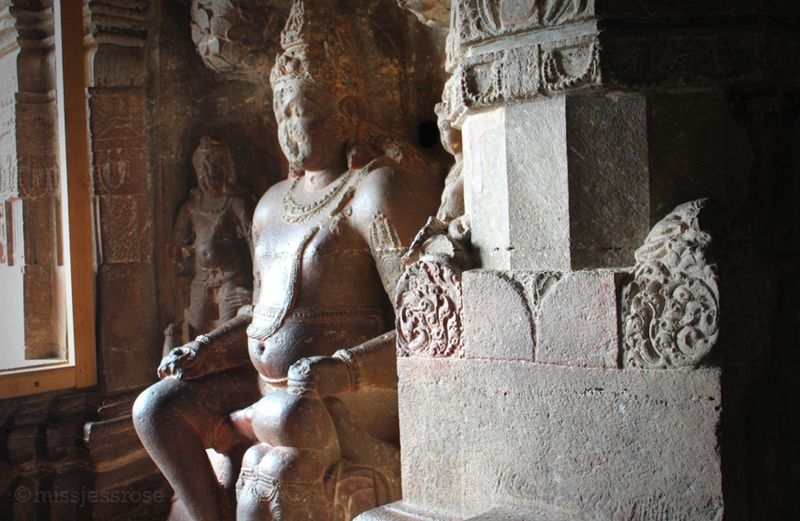 Once again, the Ellora caves are a popular tourist destination for native Indians. As foreigners, we are a curiosity to behold, a spectacle worthy of photo-taking and hand-shaking. I try to dodge the crowds, I am so tired. But it's impossible. This is India and I am a tourist, too. And so I must see all the beautiful things and all the people must also see me seeing the things. Locals taking pictures of me taking pictures, paparazzi style. Yes, sometimes after they take pictures of me, I take pictures of them.